For other uses, see Perfect World (disambiguation). 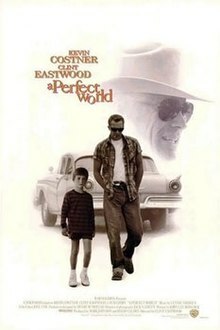 A Perfect World is a 1993 crime drama road film directed by Clint Eastwood starring Kevin Costner as an escaped convict who befriends a young boy (T.J. Lowther) and ends up embarking on a road trip with the child. Eastwood co-stars as a Texas Ranger in pursuit of the convict. In 1963 Texas, convicts Robert "Butch" Haynes (Kevin Costner) and Terry Pugh (Keith Szarabajka) escape from the state penitentiary in Huntsville. Fleeing, Pugh stumbles into a house where eight-year-old Phillip Perry (T.J. Lowther) lives with his devout Jehovah's Witness mother and two sisters. Butch follows, and hits Pugh to make him stop molesting the mother. Needing a hostage to aid their escape, Butch grabs the boy, who meekly accompanies them. The trio's journey soon hits an unpleasant note as Butch kills Terry, following the latter's attempt to harm the child. With his partner out of the way, the convict and his young victim take to the Texas highway in a bid to flee from the pursuing police. Meanwhile, Texas Ranger Red Garnett (Clint Eastwood), riding in Governor John Connolly's airstream trailer, is in pursuit. With criminologist Sally Gerber (Laura Dern) and FBI sharpshooter Bobby Lee (Bradley Whitford) in tow, Red is determined to recover the criminal and the hostage before they cross the Texas border. Also, Red reveals to Sally that he has a personal interest in apprehending Butch alive. Even though Butch doesn't realize it, Red has a history with him. When Butch was a teenager, he stole a car, and Red was the arresting officer. Butch was living with his abusive father, also a criminal, at the time. Due to his age and it being a first offense, Butch was supposed to get a lenient sentence. Red thought juvenile prison was safer for Butch than home, and muses that some of the kids who went through Gatesville turned out ok, and one even became a priest. He also felt that if Butch had been left at home with his father, he would have a rap sheet "as long as my arm." Red asked the judge to give Butch a harsh sentence. Years later, Red has come to realize that the harsher sentence only encouraged the very life of crime he feared would happen. Now, Red is hoping that if he can bring Butch in alive, he can redeem himself for his past mistake. Phillip, eight years old, has never participated in Halloween or Christmas celebrations. Escaping with Butch, however, he experiences a freedom which he finds exhilarating, as Butch gladly allows him the kind of indulgences he has been forbidden, including the wearing of a shoplifted Casper the Friendly Ghost costume. Gradually, Phillip becomes increasingly aware of his surroundings, and with constant encouragement from Butch, seems to acquire the ability to make independent decisions on what is wrong and right. Butch slowly finds himself drawn into giving Phillip the kind of fatherly presence which he himself never had. Butch and Phillip try to make it to New Mexico, but find out that the highway they are driving on is unfinished. While asleep in their car in a cornfield, they encounter Mack, a farmer, and his family - Lottie his wife, and his grandson Cleveland. Mack frequently abuses Cleveland, which Butch tries to tolerate, but when Mack figures out who he is he puts a stop to it. He beats Mack and plans on killing him, but Phillip picks up Butch's gun and shoots Butch in the stomach. Phillip walks out of the house, drops the gun into a well, throws the car keys away, and runs across a meadow. Butch follows, and rests at the tree Phillip has climbed. In the following dialogue Phillip apologizes for shooting Butch who tells him he did the right thing. Red's team surrounds the field where Phillip and Butch are situated, and Butch soon sends the boy to his mother, who has arrived by helicopter and who Butch has made promise to take Phillip trick-or-treating every year. Unwilling to leave the already wounded Butch, the boy runs back and hugs him – a gesture which, along with his knowledge of Butch's character and background, convinces Red that he can resolve the situation peacefully. His plans are thwarted, however, when Bobby Lee, mistaking one of Butch's gestures to mean he is about to draw a gun, fires a shot into his chest and killing him. The move leaves Red angry and frustrated at his inability to save Butch and take him alive. Red punches Bobby Lee and Sally kicks him in the groin before walking away. Phillip is then reunited with his mother, and they fly away in a helicopter while Phillip sadly looks through the window at Butch's lifeless body in the meadow. The last part of the film, from Butch and Phillip having breakfast at Mack and Lottie's home to the rifle shot which kills Butch, occur on November 22, alluding to the assassination of President John F. Kennedy which is occurring on the same day in Texas. Cameron Finley as Bob Fielder, Jr. While Eastwood was making In the Line of Fire, he was given the screenplay to A Perfect World. He was also in the midst of campaigning for the Academy Awards with Unforgiven and saw A Perfect World as an opportunity to work as a director only and take a break from acting. However, when Kevin Costner was approached with the screenplay for the movie, he suggested that Eastwood would be perfect for the role of Texas Ranger Red Garnett. Eastwood agreed, realizing that his screentime would not be as significant, leaving most of the time to work behind the camera. The film was shot in Austin, Texas, and Martindale, Texas, in between San Marcos and Lockhart in the spring and summer of 1993. A Perfect World was released in United States theaters in November 1993, grossing $31.1 million in box office receipts in the United States with an international gross of $104 million for a total of $135.2 million. The film received largely positive reviews, with a 79% score on Rotten Tomatoes based on 33 reviews. The site's critical consensus states, "Despite some formulaic touches, Clint Eastwood's haunting, ambiguous crime drama is smart and gritty, and features a bravura performance from Kevin Costner as a prison escapee on the run". The film won considerable praise for its emotional depth and accurate depiction of the psychology of hostage situations. Kevin Costner's subtly nuanced portrayal of the escaped convict Butch Haynes forms the cornerstone of the film's success and has been hailed as one of the actor's finest performances yet. Roger Ebert of the Chicago Sun-Times called it "a film any director alive might be proud to sign," while The New York Times hailed it as "a deeply felt, deceptively simple film that marks the high point of Mr. Eastwood's directing career thus far." In the years since its release, the film has been acclaimed by critics as one of Eastwood's most satisfying (albeit underrated) directorial achievements, and the scenes between the convict (Costner) and his young captive (T. J. Lowther) have been acknowledged as some of the most delicately crafted sequences in all of Eastwood's body of work. Cahiers du cinéma selected A Perfect World as the best film of 1993. ^ "A Perfect World (1983)". Rotten Tomatoes. Retrieved 29 March 2018. ^ a b Maslin, Janet (November 24, 1993). "Reviews/Film: A Perfect World; Where Destiny Is Sad and Scars Never Heal". The New York Times. ^ "A Perfect World". Chicago Sun-Times. ^ Hinson, Hal (November 24, 1993). "'A Perfect World'". The Washington Post.